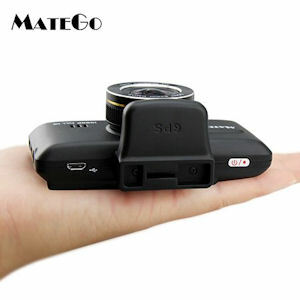 I bought the MateGo MG380G dashcam because used hardware is similar to the popular and very well reviewed Panorama G (Street Guardian SGZC12SG) cam, body and hardware are identical with eachother so there’s no difference at all between the cams. The MG380G sells under other brand names as well too. Despite the fact that all these cams are produced by manufacturer Shenzhen Onstar Technology Co. Ltd. there is only one huge difference between mentioned dash cams: the price. 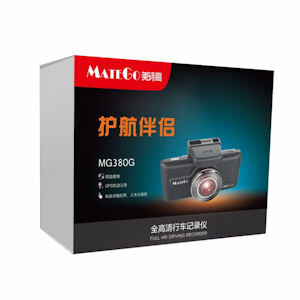 The MateGO MG380G is a low cost camera, the branded versions sell at a premium price so my choice for the MateGo was very easy: why paying a premium price for a top-notch cam when the very same cam can be bought for an affordable, relative low price? – Manufacturer: Shenzhen Onstar Technology Co. Ltd.
– Up to 128GB SDXC/SDHC full size SD Card (Class 10 Required), 256GB and 512GB SDXC SD Cards *probably* supported too. – In the box: Onstar MateGo MG380G, Suction Cup Mount, 12/24v Power Cable, USB Cable, English User Manual. 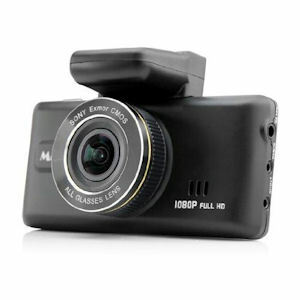 Physical casing of the MG380G has very good build quality, compared with other dashcams I had before the MG380G has best build quality. Using the cam the first time in my car was very easy and uncomplicated, connected the cam to car’s 12/24V power supply and the cam was recording straight away, without any prob. You can also connect the cam with the micro usb port to provide the cam with power, this worked flawlessly too. Only thing you have to adjust the very first time you power-up the cam is date/time and timezone, however future date/time adjustments aren’t demanded anymore because integrated GPS module will adjust such automatically. The GPS module is working extremely well, after power up the cam there is a GPS fix within just a few seconds. 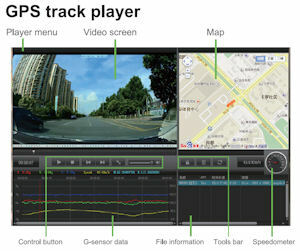 During recording there is also no lost of GPS signal/fix so the module is like the cam itself of high build quality. 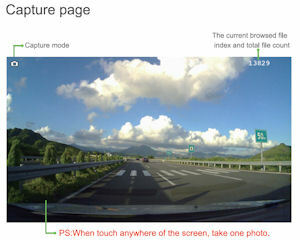 The cam has a top quality 2.7″ Smart “Capacitive” LCD Touch Screen, this is the reason settings adjustment is very easy. Touch screen is reacting very well. 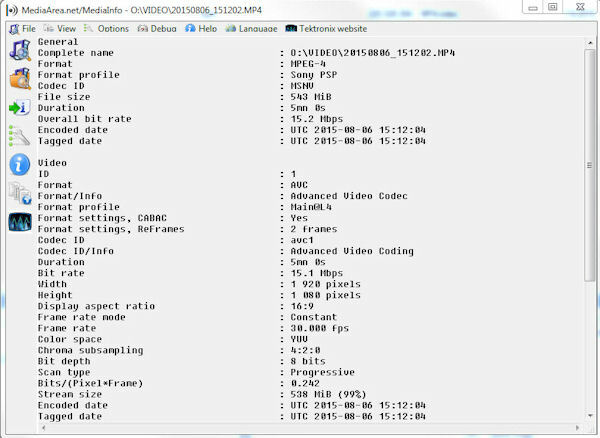 The cam has exFAT formatting firmware so no need to format a high capacity SD card in your PC before use, just stick your (SDXC/SDHC) SD Card in the cam and the cam will format high capacity SD cards >64Gb in exFAT. I tested the cam with 8, 16, 32, 64 and 128GB cards and all cards were working without any glitch. I also tested the cam with Micro SD Cards with adapter, that worked fine too. Important: don’t format a (new) SD Card in your PC, let the dashcam do that job! FWIW in the cam I use a full size Lexar Professional 633x SDXC 128GB card, till today this card runs without any malfunction whatsever. Cam has an 2015 updated Sony Exmor IMX322 sensor with excellent quality “WDR” function integrated, it provides superb quality night time recording, the best I have seen till yet. Day time recording quality is also very good. Lens is capable of taking in 1080p footage at 30fps with a real viewing angle of 154 degrees, this is the reason this cam will miss absolutely nothing. Noteworthy is the fact this cam use a capacitor instead of a battery, this means that the cam has no problems at all with high temperatures in your car. Cam firmware (recent firmware is v1.02.00, see below for downloadlink) is working very well, OTOH no possibility to fine-tune recording settings like e.g. White Balance and EV.To be honest this cam don’t need fine-tuning at all because the cam is adjusting all settings demanded for best recording quality automatically. But: many people want to have the possibility to make some adjustments by themselves. 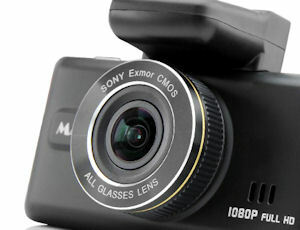 The Onstar MG380G is probably best bang for the buck, it’s a top-notch dashcam with very good build quality. Used hardware is recent and up-to-date, all hardware components are of high quality. Daytime time recording quality as well recording quality during night is superb. Firmware needs improvements regarding manual White Balance and EV fine tuning. Logs only in KPH, no possibility to change to MPH. Included USB cable is too short however included 12/24V power cable is long enough. 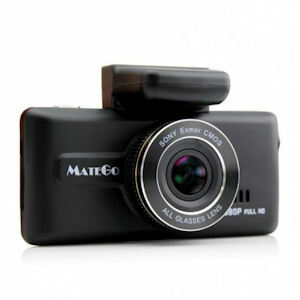 I know you can buy much cheaper dashcams, same is valid for more expensive cams. But please consider that this cam is very reliable and therefore will provide you with that what really counts: useful proof at the moment you need such, e.g after a car accident. I can recommend this cam without any hesitation. Important issue: where to purchase an action/dashcam? You can buy them on many places like e.g. Amazon, eBay, AliExpress, Dx.com, local vendors and online dealers/vendors. It’s hard to find a reputable vendor not only selling quality cams but also providing good support and service during and after the purchase. And keep in mind, a good feedback score on sites like e.g. Amazon, eBay or Dx.com isn’t a guarantee at all that seller is reliable. As I told before it’s very hard to find a reliable action- and dash cam retailer, hence in this review we have two retailer/vendor dedicated sections: 1) 6.3 Recommended action- and dash cam retailers and 2) 6.4 Non-recommended/inadvisable action- and dash cam retailers. Titles of these two sections are speaking for itself, by recommending or not recommending certain retailers we try to help action- and dash cam buyers to find a reliable retailer, or opposite, to avoid certain retailers. Note to retailers: if you are an action- or dash cam retailer/vendor, no matter what brands you sell, and are opinion you are reliable please fill out the contact form on bottom of this review completely, if we like what we find out about you there’s the possibility we will add you (for free) to the survey of recommended retailers. This survey will include links to your sales channels. 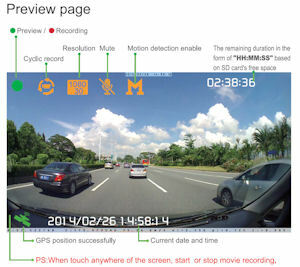 Personally I had very bad experiences with a well-known eBay dashcam seller located in China (as I described in a previous blogpost) so many times it’s a matter of having good luck to find a decent seller. Finally, don’t look only for cheapest dashcam price when you have the intention to buy a cam, service and support is equal (and probably even more) important. Most of the time it’s better to spend a few bucks more and purchase a dashcam from a reliable and decent seller instead of preferring a cheap seller. User Manual Onstar MateGo MG380/MG380G in Chinese/English language can be downloaded here, it’s downloadable from Google Drive. Firmware v1.01.03 (2015/06/16) Onstar MateGo MG380/MG380G can be downloaded here, it’s downloadable from Google Drive. 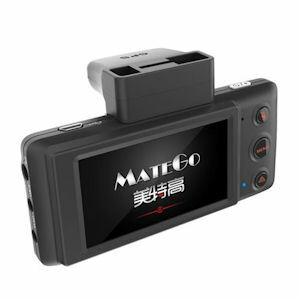 It concerns the original, unaltered Shenzhen Onstar MateGo MG380/MG380G firmware, don’t try to flash the firmware on other dashcams. Update 2015/10/29: firmware v1.01.04 is released, there is no list of firmware changes available. This Onstar MateGo MG380/MG380G firmware can, like previous firmware v1.01.03, be downloaded from Google Drive here. Firmware upgrade instructions are included. Update 2016/01/06: firmware v1.02.00 is released, this is an important firmware upgrade, will optimize video quality. This most recent Onstar MateGo MG380/MG380G firmware can, like previous firmware v1.01.04, be downloaded from Google Drive here. Firmware upgrade instructions are included. Note: keep in mind that while flashing an electronic device with updated firmware can be beneficial to you, the risks that are involved can sometimes outweigh the benefits for the user. Flashing an electronic device can be risky and when done improperly, you may “brick” your device. “Bricking” a device renders it entirely useless. 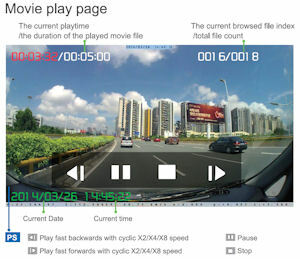 There are several Video Registrators/GPS Track Players available, however I strongly advise to use Registrator Viewer, IMO it’s Simply The Best Player For Dashcams you can get, it’s also free. Very sadly the Registrator Viewer developer was killed in a tragic motorcycle accident some months ago, therefore his website is expired and (of course!) you can’t download there the software anymore. However the software is still available and downloadable via my Google Drive, download the latest version 6.0.0.8 of Registrator Viewer here. User Manual in English can be downloaded from Google Drive too, download here. Demanded Operating system Registrator Viewer: Windows XP / Vista / 7 / 8 [x32 and x64]. Not known it will work with Windows 10. – For playing FullHD video requires a processor with a total frequency of all cores of at least 4 GHz or support DXVA (hardware decoding) in the graphics card. – For the user interface requirements are negligible.